Rich People are Evil : Proven by Science! I'll apologize right off the bat for the title of this article. No rich people are not evil and it hasn't been proven by science. But my title here sums up my perception of this article: Wealthy More Likely To Lie or Cheat: Researchers. Yes thats right. Someone actually tested whether or not rich people would steal candy from babies. Well maybe not babies but at least children. Its more or less the same thing. If you're an evil rich person and predisposed to stealing candy from children then taking from babies would of course not be off limits either. Thats just common sense. But don't worry, they do explain that not ALL rich people are cursed with a black heart, and they say : "Piff and his colleagues also said the associations they found were likely to have exceptions". Well thats refreshing to know that they opened the door to the possibility that everyone with money isn't necessarily a jerk. I tried to find the actual study. Best I came up with was an abstract. But its one of those deals where they want you to pay money for the full document. I'd like to have read the entire article but I'm too cheap to spend good money on something like this. I will just have to be satisfied with mocking the study as reported by the news media. I suppose the authors next project will determine whether or not handlebar mustached wearing landlords are or are not likely to tie poor helpless girls to railroad tracks. Stay tuned! 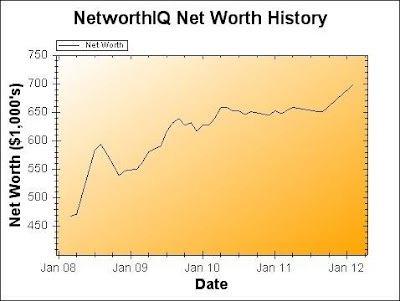 I track my net worth on NetworthIQ. At the end of February 2012 our net worth was $698,548. That is a substantial increase of $46,897 versus the last time I reported our networth in September 2011. This value of $698,584 is a new high for our net worth. For nearly the past two years our net worth has mostly bounced around $650,000 give or take $10,000. Most of that was due to the real estate and stock markets. Having our net worth go up substantially over the past few months is a nice change. Our assets are up across the board compared to September. We've accumulated more cash mostly due to year end bonus money I get from my job. Our retirement accounts are all up pretty significantly since the stock market has been doing fairly well lately. Our home is worth a bit less but our rental properties are up overall. My stock options at work are also worth a fair amount more since my employers stock has been rising steadily lately. Alternative Fuels and Advanced Vehicles Data Center (AFDC) of the Dept. of Energy has a Vehicle Cost Calculator. The calculation allows you to specify your mileage and how you drive and it figures figure the cost of fuel. It lets you pick the car you want by year, make and model. They also add in various other costs of the car including maintenance and depreciation. This results in a 'total cost' of ownership style of calculation to figure your accumulative cost over many years. I like that they give you the ability to customize for your own driving usage rather than just assuming typical average American driving pattern of logging 12,000 miles a year 40% in the city and 60% on the freeway. If you're looking at an electric car like a Nissan Leaf or Chevy Volt the calculator also takes into account variable electricity costs for different locations across the USA. I'm going to try out their calculator and compare three different cars across three different driving scenarios. The cars and driving scenarios I'm choosing are mostly just arbitrary to give en example of how the calculator works and what we can do with it. You can pick cars of your own to compare and then plug in your own driving scenario to get results that would be meaningful to your own needs. For all cases I'm using a gasoline price of $3.50 per gallon and I arbitrarily picked an area that has relatively inexpensive electricity of just 7.5¢ per kWh. Most places in the USA have higher priced electricity. I then chose 3 different scenarios with differing driving habits. This is meant to be the average driving amount. I'm guessing a typical driver usually puts 20 miles or sow on their care in a typical day and maybe half of that is on the freeway. They may take another 4000 miles of other trips with 80% freeway driving. This is a lower driving amount with low freeway miles. I'm using my on Dad as the model. My Dad drives around town quite a bit but he doesn't use the freeway much and doesn't really take out of town trips . I would make a rough guess that he might drive around 40 miles a day. I'd put his freeway driving at only about 10%. I added in 0 miles for additional trips. This case is like case 1 but instead of just 20 miles a day they drive 75 miles a day for work and 90% of it is freeway. 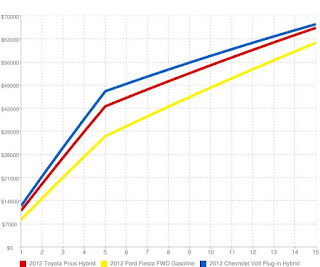 Here are thee resulting graphs showing the cumulative cost for the 3 cars in my 3 scenarios. Click on each of the graphs to see the full size image. 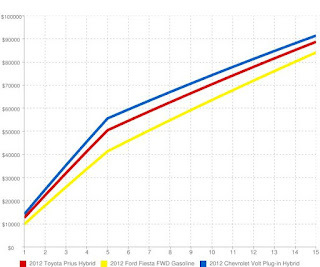 In all 3 cases you can see that the cheap Ford Fiesta is the overall cheapest car from start to finish. Gradually over the years the Fiesta starts to catch up in cost due to its higher fuel costs. However the charts go out to 15 years and that seems like a fairly reasonable practical maximum life span for a car. I really wouldn't expect a car to last you longer than that. Again, the 3 cars are just an example comparison. I'm not trying to make a point about these three cars nor am I going to insist everyone go buy a Fiesta. You should compare cars of your own choosing in your own driving scenario. Maybe your comparison would be between a hybrid Ford Escape and a Honda Minivan which you might use for your flower delivery service. Or maybe you want to compare various family sedans in your own suburban driving needs. Bottom Line : The vehicle cost calculator at the AFDC website is another tool to use to compare the overall costs of different vehicles. I like that the tool lets you fine tune the driving usage and considers variable electric costs. A lot of people own some jewelry. If nothing else you may have an engagement ring of considerable value. What would happen if you were to lose that ring or if it were stolen? If you have insurance coverage for your jewelry then it can help protect you against such a loss. I honestly can't say if anyone would really need jewelry insurance. I don't know how often people actually lose jewelry or how practical insurance is. If I think about it one way, I would say that since jewelry is not a necessity there is no need to have it and therefore no need to replace it if its lost. You might enjoy an expensive heirloom broach but if you lost it you would only be out the cash and would not experience any kind of hardship. Another way I would think about this is that the best option financially is to not buy or own expensive jewelry in the first place, which saves you money all around. In most cases I think insurance for jewelry is not necessary. Thats just my opinion on the topic. On the other hand accidents can happen and insuring against risks can make sense. Some people really enjoy jewelry and if they can easily afford it then who am I to say they shouldn't own the things they like. If you do own expensive jewelry then considering the risks of losing it might make sense. Maybe you are particularly prone to losing things and there have been a rash of burglaries in your neighborhood. In such a situation maybe insurance makes good financial sense. Another reason to buy insurance is simple peace of mind. If you are a jewelry lover and have a collection worth a fair amount then not having insurance could be stressful and make you worry far too much about potential loss. If you really feel you need insurance and you can afford it then I don't see a problem with buying it. First thing to do is to check and see if your existing insurance coverage may already cover your jewelry. If you have home insurance or a renters policy then it may provide some coverage for lost or stolen jewelry. You may have enough protection there already to cover your jewelry. However such coverage often has limitations and is not likely to cover the full cost of a more expensive piece of jewelry. If your existing policy doesn't have enough coverage then you can check how much it would cost to add a rider to the policy to increase the coverage for specific pieces of jewelry. You may need to get an appraisal or at least provide proof of the purchase cost for the items in question. Another option is to get separate insurance just for the jewelry. At least one insurer known as Jewelers Mutual will write policies to cover one or more individual pieces of jewelry. They will even give free quotes for policies online without having to call and talk to an agent. Just for example sake I got a quote off their site for a $10,000 ring with a $1,000 deductible. The annual cost for such a policy was quoted at $86.00. It may vary based on location and thats just a quote. They even have the policy available to view online. As with anything you should do your research and shop around. Look for reviews of insurance companies and compare prices from multiple providers. Specialty insurance can be very expensive or quite practical depending on where you get it. You should also make sure to read the actual insurance policy and fully understand what it actually insures. It would be a waste of insurance payments if your insurance doesn't even cover what you want and expect it to. Your first line of defense against a loss is to be simply careful. I am no expert on being careful with jewelry but I can at least mention some common sense tactics. You should of course not leave your expensive jewelry laying around so anyone can see it. If a burglar or other thief gets into your home and finds all your jewelry nicely displayed on your vanity in an open jewelry box then you've unnecessarily aided them. Being careful with jewelry on the beach, in swimming pools or in other active pursuits like sporting events is also smart so you don't lose a ring or other piece of jewelry. Making sure your rings are property sized so they don't accidentally slip off is a good idea as well. Bottom Line : Whether you chose to get insurance for your jewelry is up to you ultimately. If you do get insurance then make sure to shop around and consider a specialty insurer and compare to coverage through your existing policies. That last article is one I found via the March Madness competition on FreeMoneyFinance. The competition has a lot of good articles from varied PF bloggers. Its a fun way to read some good articles and get an introduction to some blogs you may not have seen before. Are you aware of new 401(k) policies? This is a guest article from FiPath. The majority of Americans in many plans have long complained that the 401k information they receive is not only confusing but also incomplete. Many plan participants that have recently changed jobs must decide what to do with their existing 401k accounts, especially those nearing retirement. Additionally, many don’t have enough saved in their 401(k) plans to help cover retirement and they are unsure of where to find solutions to these issues and other questions they may have. Federal regulations that take effect on April 1, 2012 will require 401k providers to supply more information about plan costs, which may affect consumers’ 401k to IRA conversions. Workers looking forward to a comfortable retirement need to make sure that they are up-to-date on policy changes that may affect their 401k and IRA accounts. Greater fee disclosure and more pressure on employers to pick cost-effective plans will hopefully drive overall 401(k) plan costs down, promote transparency and possibly improve quality. Become clear on your financial needs - what will I need to retire? How much do I need to save? FiPath is bringing consumers up to date on the new regulations and can provide insight on how consumers can make smart decisions about their 401ks and what the new policies mean for investors. FiPath is working to help consumers of all types take control of their financial future - with easy-to-use financial tools to connections with local, qualified advisors, as well as a forum for collaboration with peers, so consumers can get a broad variety of opinions and make the best decision for themselves. Visit FiPath to learn more about new Transparent, Consumer Friendly, 401(k) Plan Rules and Regulations. Most of us are aware that the price of gasoline is much cheaper in the U.S.A. than in most other countries. One of the key reasons that our gas is so much cheaper is that we have lower tax rates on gasoline than many countries. I found the following graphic that shows the gasoline and diesel tax rates per gallon for various nations. The data is from the Department of Energy's Alternative Fuels and Advanced Vehicles Data Center website. I found the direct XLS link via a google search. The document says the data is current as of 1/1/2010 so its about 2 years old at this point. I'm sure that at least one of the nations has changed its tax rate since then so this is undoubtedly not all accurate. But its an accurate snapshot of fairly recent tax rates. You can see that the U.S. is the second cheapest listed only higher than Mexico. Oddly enough it looks like Mexico pays a negative tax, but that is most likely a reflection of a subsidy for gas prices there. Most of the nations listed have gasoline taxes of $2 to $4 per gallon. The data sheet says that that figures do not include VAT. Its my understanding that many countries also charge a VAT or sales tax on top of the gasoline taxes. That means you could spend another 20% on top of the fuel taxes given. In 2011 my total cash back rewards from our credit cards was $510. We spent about $36,067 on our rewards credit cards so our total rewards return is 1.41% of our spending. By comparison for 2010 my rewards totaled $686 which was a 1.75% return rate. Back in 2009 the total rewards was $552 which equates to 1.55% cash back. The % return for 2011 is lower than the previous two years by a little bit. I don't do much work to maximize our rewards. I just use the two credit cards. We use the Costco Amex card for the majority of our purchases and the Citibank dividend mastercard for a little bit. One reason our rewards dropped in 2011 versus other years is that we have eaten out at restaurants a lot less and the True earnings card dropped the reward rate for restaurants from 3% to 2%. If your pension announces that it is officially seeking to be classified as a "church plan" then this could be a potential sign of trouble. Particularly if the employing organization isn't really religious in nature. This cautionary tale of the Health Center at Orange is such an example. The failing pension tried to obtain church plan status out of the blue in an apparent attempt to dodge pension regulations. If you work for a organization that has religious affiliation then your pension may not have the protections of other pensions. Pensions operated by religious groups can have a "church plan" status that exempts them from regulations for pensions. The PBGC does not generally insure pension plans from church groups. ERISA does not apply to church plans. Normally for most private pensions the PBGC acts to provide insurance for pension plans in case they fail. ERISA law also regulates pensions to make sure the pensions are Basically as far as I can tell theres really no laws or protections for pensions operated with "church plan" status. What this could mean in the worst case is that if you retire and your pension fails completely and exhausts its trust fund then you could end up without any pension benefits. A sudden change to "church plan" status might be a sign of trouble because the pension may want that status so it can avoid the rules and regulations that pensions normally have to follow. I would be wary and critical of such a change in status particularly if your employer is having financial difficulties or if you know that the pension is seriously underfunded. This is not to say that the church plan status isn't appropriate or that anything is necessarily amiss. You may work for a church that is seeking church plan status as a matter of legal right. Its also possible that there are reasons the church would want to avoid regulations that would actually benefit the plan financially which would then benefit you in turn. Saint Peters University Hospital requested official 'church plan' status but they seem to be doing just fine. They pay for PBGC insurance and are 90% funded and voluntarily follow most ERISA rules. They claim they want church plan status only so they can spread out their pension payments rather than being required to make a lump sum. 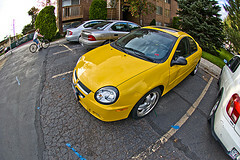 Lets say that you own a bright yellow 2003 Dodge Neon SXT that you're just dying to sell. How do you go about finding out how much the car is worth? You could check the Kelly Blue Book value as that is one of the 'defacto standards' for car prices. You could also just drive down to the dealer and ask them how much they'd give you as a trade in. I went to the Kelly Blue Book site and checked the private party sale price value for a Dodge 2003 Neon SXT with 90,000 miles. KBB says that such a car would be worth $4,346 in 'good' condition via private party. I also checked the price at the N.A.D.A. site. They said that a 'clean trade in' value for the Neon would be $3,225. The retail price they gave was a shocking $4,950. They did not have a private party sale value listed that I could see so I'll go with the closest trade in value. I then went to Edmunds and looked up the same '03 Neon and they said that the same car was worth just $2,909 via private party sale. Lastly I went to Craigslist and searched for Neon's currently for sale. I found a 2003 with 120k miles for $3,350 and one with 105k miles for $3,750. Thats 4 different sources for prices with 4 quite different results. How do we make sense of all this? There isn't a single source for the 'right' price on a car. The best you can do is get several sources and find a range of prices. Personally I tend to think that KBB values run on the high side. And as we see here they are the highest price quoted for private party value on the Neon in question. 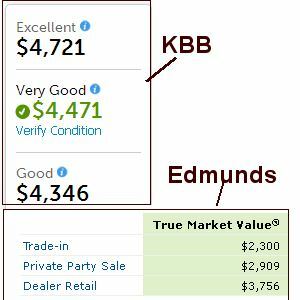 Edmunds are both typically lower than KBB from what I've seen. I'm not as familiar with NADA prices so I'm not sure where they usually fall. The prices on Craigslist might be the most useful since that is the local market you're looking at. If cars in your town routinely sell for $3000 then it doesn't really matter if KBB or Edmunds think the car is worth $4000 or $3500. However with Craigslist prices you do have to look closely at what is being sold. For the two prices I found both cars had significantly more miles than the theoretical car I'm trying to sell. The cars listed had 105k and 120k miles while mine has only 90k. My car should be worth more than the other cars based on my lower mileage. I would also try and watch Craigslist for a while and see how prices vary over time. Its possible if you find a single price for a similar car that it may just be over priced or under priced. You'll want to find a few prices for similar cars on Craigslist to get an idea of the typical selling prices. Of course sometimes theres nobody selling a similar car in your market on Craigslist. If you can't find the same model and year you might expand your search to look at the same model from a year before or after yours. If I didn't find any 2003 Neons then I might look at a 2002 or 2004 model. I would then assume that a 2003 would be worth a bit less than a 2003 and a 2004 would be worth a bit more. If that doesn't work you can also try searching Craigslist in other cities. Another city in your state may have prices pretty similar to your city. You can also try looking for prices in your local newspaper. People still do use the print newspapers and there is still a market there. Another source of data is the Autotrader.com website. They tend to have more dealer prices but do have some private party listings as well. Once you've gotten prices from the various sources this gives you a range to work with. From the four sources we have a price range of $2,909 to $4,471. Its pretty save to say that the Neon is worth something in that range of prices. This is a pretty wide range of prices, but we at least know we should stay within that range. I would fine tune the prices by relying on Craigslist data more assuming we find several prices on Craigslist. You wouldn't want to try and sell a car for much more or less than what others are selling them on Craigslist for. Deciding on what you think the right price is will depend on your own situation. If you want or need to sell faster then you may want to price on the lower end. Ideally you can take your time to sell. If you aren't in a rush then you should start with a higher price and then gradually lower the price if necessary. Maybe you're in the market to buy instead of sell. For buyers the opposite applies. If you're in a rush to buy you may not want to be too picky and just settle for the best car you find quickly. Hopefully you aren't in such a rush and can take your time and hunt for a good bargain. Finding the market price on a used car is not necessarily an exact science. The best way to go about it is to find as much data as you can from several sources and get a range of prices. From there you want to pick the price that suits your needs, ideally preferring to buy low or sell high. I've been working on a series of posts about how starting salaries vary across universities for various majors. First I presented all the data I found. Then I stated that I thought major choice mattered more than university choice. Most recently I made the observation that highly ranked universities often didn't relate to higher salaries. At the end of the last article I made a couple points. The U.S.News rankings are university wide rankings and schools have different reputations in specific fields of study. For example Purdue is ranked #62 among national universities but they are ranked much higher at #11 for engineering schools. If you're looking at engineering degree holders then looking at the U.S.News best Engineering schools ranking list would matter more than the general national ranking of the university. Second major factor to consider is that pay rates vary considerably based on location. Pay is going to be higher in an expensive state or city versus a low cost area. You would expect that graduates of California schools would likely end up having higher wages since most of the alumni would end up working in California. On the other hand students of Kansas schools may end up with lower average wages if more of them ultimately work in Kansas. To examine the impact that these two factors have I'm going to look at civil engineering specifically as a case. There seems to be a little more correlation between the rankings of the engineering schools and the starting salaries, but its still not that strong. The top school in engineering ranking still gets lower salary than three of the schools below them. However the 3 lowest paid schools are in the bottom half ranked schools and the 2 highest paid are in the top half. Lets look at the starting salaries versus the average wage for the civil engineers in the state. I got the average wage for civil engineers from BLS state level wage data. There is some correspondence between the average wages for civil engineers and the starting pay. In Texas for instance they have a relatively high starting pay of $89,110 and the U. Texas starting salaries are also quite high at $57,454. High wages in the state of Texas for Civil engineers might at least partially explain why U. Texas grads have such high pay. If you look at it this way, Purdue actually fares the best in starting wages versus average salary. Theres still not much of a correlation. The school with the highest and lowest starting wage versus average local wage are both in the middle. For Civil Engineering at least I still don't see much of any solid correlation between university rankings even when looking specifically at the reputation of the engineering school itself and when controlling for the average wages in the area. I ran all the same numbers for Chemical Engineering as well and heres the result from them. Again I don't see strong correlation between engineering school ranks and the starting wages even when normalized to state average wages. It certainly makes more sense to look at the reputation of a school for the specific field of study than to look at the national level university rankings. But even there it doesn't seem to show a strong correlation between starting wages and school rankings. The average pay for a state can certainly impact starting wages. You would assume there would be a relationship between the two. I think we can see that to some degree in for some places like Texas where state average wages are the highest and the starting wages for U. Texas grads are also higher. Yahoo carried an article about how A Bunch of Young Lawyers are Suing Their Law Schools Because They Don't Have Jobs I've said before that law school can be a bad investment. Earlier this week I shared some data I compiled showing starting salaries for several majors across a number of different universities. Then yesterday I made the point that the major choice matters more than the university choice. Another very important finding from the data I saw was that the ranking of the university often had little or no correlation to the starting salaries for each major. With only a couple clear exceptions, it seemed that the university rankings often had very little direct proportional relationship to the starting salaries of graduates. One might expect that if you have 3 schools, ranked #5, #43 and #110 that the salaries would be highest at the #5 ranked school and the lowest at the #110 school. More often however in the data I looked at this kind of relationship between school ranking and pay rates did not show up. You were just as likely to see the highest pay for the #43 school or the #110 school as the #5 school. I'll look at each major a little closer. The one major I saw with a pretty solid correlation between the ranking of the school and the wages was computer science. In general the higher ranked schools all clearly had higher average wages and the lower ranked schools had lower rages. Graduates of highly ranked schools had salaries that were significantly better than the students from lower ranked universities. The Stanford grads with psychology degrees made substantially more than the psychology majors at other schools. For psychology the top 3 ranked schools all had higher average starting wages than the lower ranked schools. Nursings highest wage was at Pace U. which out earned four schools above them. However if you set Pace aside then the other 5 schools do get generally higher wages for higher rankings. The top two schools had higher pay than the middle two which and the bottom ranked school had the lowest pay. Civil Engineering : The highest wages were at University of Texas which is ranked #47. Carnegie Mellon #23 and University of Washington #43 both had higher rankings and lower wages. Purdue at #62 also had higher wages than CMU or UW even though it was even lower ranked than Texas. Chemical Engineering : The lowest average wage was at U. W. ranked #43. The highest wage was at Texas ranked #47 and the two bottom ranked schools had the 2nd and 3rd highest wages. Elementary Education : Wages for teachers were all over the place. I assume that the wages are mostly dictated by how much teachers are paid in the given state on average more than anything. Teachers simply don't make a lot so theres no ta lot of room to get fat paychecks from having an impressive school name on your resume. Central Michigan had the highest average wages yet they were the lowest ranked school. Wages at highly ranked U. Penn. were lower than several lower ranked schools. Communications and English: The wages for these two majors were up and down across the school rankings. Unranked C. Michigan had higher wages than 6 higher ranked schools in Communications. The highest pay for English was at #170 ranked Pace University. Accounting : For accounting the wages seemed to show no relationship to the university rankings. The wages actually went up as you went down the ranking for the four highest ranked schools for accounting. There are other factors involved than simply the U.S. News rankings. Two big Factors : Rankings for specific programs and Geographical location. The U.S. NEws rankings are a top level ranking of the entire university. However some schools excel in some areas more than not. For example Purdue and U. Texas are well thought of engineering schools. The schools quality and reputation in the field of study may have more impact on salary than the overall U.S. News rankings. Geographical location also has a big impact on starting salaries. I would generally expect starting salaries for Kansas State and Wichita graduates to be lower than the pay for Pace University (in New York City) simply due to the different average pay rates for the state of Kansas versus NYC. You could also expect that students from Stanford and Cal Poly would have a bit higher wages simply due to living in high cost and high wage California more than not. The reputation of a school in a specific field of study as well as the varying wage rates and cost of living for the city or region the school is in could easily have more impact on starting wages than the general U.S. News rankings. Yesterday I presented some data that I compiled showing the variation of different starting salaries for several majors across a number of different universities. Choice of major has a larger impact on starting salaries than the choice of university. Certain majors make considerably more than other majors regardless of the university attended. The average starting wages for civil engineers, chemical engineers and computer science were all higher than all the English, Communications, Psychology and Elementary school teachers. If you're looking for a higher wage then getting a degree in engineering would serve you better than humanities. The choice of university does not appear to change this. This may come as no surprise to some people and others may be doubtful. We are often told that the very best universities offer networking opportunities and the expectation is that simply graduating with those names on your diploma will ensure a high income. There could be some truth to this and I'm sure it is often easier to find a higher paying job with a Stanford degree than one from Central Michigan. However from the data I found the highest wages are based on degree and not choice of school. The evidence I found is that the psychology majors at Stanford have lower starting wages than the engineering majors at Central Michigan. The choice of majoring in engineering has a heavier impact on starting salaries than the quality and prestige of a Stanford education. I'm sure nobody is really making the choice between majoring in engineering at Central Michigan or majoring in English at Stanford. However some people may feel that choice of major doesn't matter as much as their choice of university. Some people think that if they just go to the right school then they'll get a high wage no matter what they major in. I have a friend who had that exact assumption going into college. He majored in humanities at a respected private school assuming that the school name alone would get him a good job. Unfortunately he only really learned the truth after he graduated and failed to find anything more than minimum wage level jobs. It is important to understand that the choice of major is the primary factor in your future earnings. Choice of college can have an impact on earnings but it does not outweigh choice of major. There are several studies that show the average starting salary for a given profession or various college majors. There are also some research that shows average wages for alumni of various universities. You can find out the average wage for an engineer or a nurse and you can find out the average income for a Harvard grad or a University of Florida grad. But I don't see any studies that give you average wages when majors and universities are combined. I decided I'd try and put together a little bit of data in to show the average starting wages for various majors at several different universities. There are some significant limitations to the data I have. This is only a small sample of data. Often the surveys only have 10-20 replies so they are small sample sizes that are subject to some distortions. For example if one student happens to get a very low or very high wage then it will skew the numbers a fair amount. I don't consider this information to be conclusive or very scientific. I think its probably 'good enough' sample to get an idea of what the trends are but to have a real solid study you'd have to get a lot more data than I found. I could only find information self reported by a few universities. Many of the schools don't have survey data available, or at least not that I could find. The schools I searched for were mostly randomly selected. I wanted to have some distribution of schools of varying quality. I decided to try and find schools with high, middle and low rankings as ranked by the U.S. News College rankings report. I started by trying to find a few of the top 10 schools and thats why I have Stanford and University of Pennsylvania. I then randomly found some other universities. I also searched for many other universities by name that I picked randomly but couldn't find information. I also tried to find schools from different parts of the nation. There are universities from the West coast, Midwest. Northeast and the South. Stanford and U. Pennsylvania are both ranked #5 by U.S. News. They serve as my examples of highly rated, prestigious schools. Carnegie Mellon, University of Washington, U. Texas at Austin, Purdue and Virginia Tech are all in between the #20 and #80 position and the schools I consider to be in the "good" range. South Carolina, Kansas State and Pace University are all below #100 ranking and these schools are the "lower ranked" schools. The "unranked" schools are Wichita and Central Michigan. Finally I've got Cal Poly and Western Washington university which are 'regional' ranked colleges rather than nationally ranked colleges. I don't know exactly how regional vs national rankings compare. For chemical engineering and civil engineering their appears to be little correlation between the U.S. News rankings and the starting salaries. The lowest and highest civil engineering wages are $48,985 and $57,454 which is about 17% difference. The chemical engineering wages ranged from $57,280 to $72,234 which is 26% difference. Computer science majors see a much wider spread of wages and it appears to be pretty proportional to the U.S. News rankings for the university. The lowest Comp. Sci. average salaries are $50,133 and the highest is $84,832 which is 69% higher than the low. The top 50 schools for comp. sci. all averaged wages in the $76,000 to $84000 range. The lower ranked schools all had average wages of $69,000 or less. Next I picked some humanities and liberal arts fields. I picked elementary education, communications, English and psychology. Elementary school majors had little difference in wages related to the ranking of the U.S. News rankings. I am assuming that the elementary school major wages are highly dependent on local school district rates and do not relate to university. It should also be noted that some of the teachers wages for just a bachelors are likely underemployed as many states require additional schooling. In other words in some areas a teacher with just a bachelors won't get a full teacher position so wages reported at bachelor level are likely not always for full teacher positions. For English and Communications majors I don't see a significant relationship between the U.S. News rankings of the university and the salaries. Psychology major salaries seemed to correlate some to the U.S. News rankings. The top 75 ranked schools all had wages above $32,000 while the lower ranked schools were all below $31,000. The average starting salaries for accounting and nursing majors have less correlation to the U.S. News reports rankings. For both accounting and nursing the highest wages were seen in middle ranking universities. The low for Accounting was $38,422 and the high was $52,000. Nurses made $41,905 average as a low and $62,000 as the high. The variation between high and low in Accounting was 35% and the spread between nursing was 48%. Thats a basic run down of the numbers I found. I will talk some more about the data tomorrow and give some of my own conclusions. What Does Bus Fare Cost? The other day I mentioned that I don't take the bus myself simply because it would take too long to get to work. But for a lot of people taking the bus or other mass transit can be a great way to save money. The cost of mass transit varies from city to city. I found this document that lists single adult fare rates for a variety transit systems. If you skim through that you can get an idea of how prices vary. I also then looked up the websites for several cities to see how their prices for single fares and monthly passes compared. Generally the costs fall within a certain range. Typical single basic fare ride tickets are in the $1.10 to $2.25 range. The median is $1.75 and the average is $1.78. The basic fare can be for a shorter ride and mass transit programs often charge a higher fare for longer rides. I did not record the higher fare rates but they typically run closer to $3 per trip. That would be the kind of ride that takes you all the way across town in a larger city. For a monthly pass the median is $71 and the average is $70. If you take the bus frequently like a daily commute to work then a monthly pass will easily pay for itself. Bottom Line: The bus typically costs around $1.75 per ride and $70 for a monthly pass, give or take. Financial ratios are one way to do a quick assessment of how you're doing. The 5 ratios below can give you an easy snap shot of how you're doing. FreeMoneyFinance discussed the five financial ratios below, three of which were from The Dough Roller. 1 ) Emergency Fund Ratio (Liquid Assets/Monthly Expenses) -- The generally accepted rule of thumb is that you need 3 to 6 months of expenses in an emergency fund. 2 ) Doomsday Fund Ratio (Financial Assets/Monthly Expenses) -- How long could you last with no income at all? 3 ) Net Worth Ratio (Net Worth / (yearly income * age / 10)) -- You want this ratio to be 1 or higher. 5) Retirement Fund Ratio (Retirement Savings / Yearly Income) -- The goal is to retire with at least 12 times your annual income. I come out pretty well on the first four. For the first two I used our normal spending. However we could easily cut our spending if we paid off our home mortgage and cut back on some discretionary spending. If we paid off our home mortgage using liquid assets then the doomsday fund would come out to over 12 years. We look pretty bad in the last ratio because a lot of our assets are not in traditional retirement savings. I only used our 401k & IRA account balances for that. However I consider our real estate to be retirement investments as well. We have a much higher % of our assets in real estate investments. If I added those then I'd have a higher ratio there. Personally I'm mostly focused on the #1 and #2 ratios. I want a high amount of liquid savings / emergency fund so we can ride out any potential disasters. I'd also like to have that 'doomsday' fund high enough to last decades. I look at that as another measure of whether or not I'm ready to be truly financially independent.